DITHOT and I just want to give you a heads up that you have an extra 2 weeks to read A Transatlantic Love Affair. Real life has intervened in our Noodlemantra world and necessitated that we begin our tidbits for A Transatlantic Love Affair in mid September. 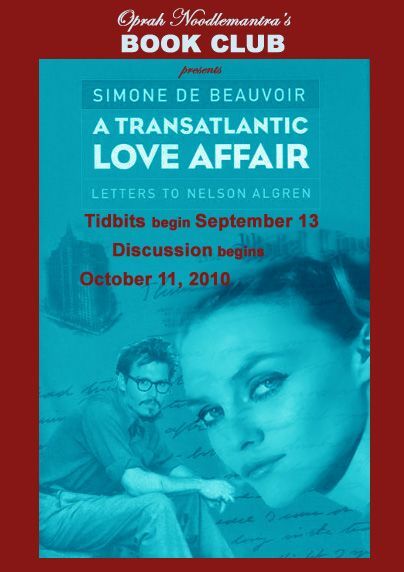 We will begin our discussion of the letters of Simone de Beauvoir to Nelson Algren on October 11. We hope that you are enjoying the book and that you will check in on our tidbits beginning September 13. I think that this will be an interesting discussion. Glad to have the extra time to finish as I am only a little over half way through. I think this will be another case of wishing I had the tidbits first and read the book second. Totally agree this will be a great discussion! At the rate I’m going I will have the tidbits first and the book second. I tossed the book on my ”to read” stack and have not touched it since. The letters are fun to read. I'm now 30 pages each day so I will finish in time for the tidbits. After a long absence from the Zone, I decided to take on this book. I'm needing more time too, so glad the tidbits are posponed. However I am awaiting them. Thank you for taking the time to do the research! I have to admit to being absolutely sloven in my reading of ATALA, very little progress honestly. I hope to be ready in time for the discussion, thanks for the extra time. I am glad this delay is welcome. Buster, oh how I wish I was in France working on my research for this book. And just a heads up that there will be a couple of pre-tidbits….but beware of spoilers. I will preface each one with the page number to which you should have read so that it is not a spoiler. Keep a sharp eye for these teasers. Thanks Liz, the Zone is a great distraction to a very busy life. I love it! Be looking for your teaser tidbits. Glad to see you back, Lady Jill! See you in a few weeks! Just ordered my copy!! I don't ususally join in ONBC - but being such a Van-Fan - I have extra interest in this story. We're happy to have you join in, Kitty! Hey Kittycat, looking forward to you joining us. Just got my copy this afternoon. I started right in. I am into the first few letters. This is going to be a beautiful read. I can tell already. I just have to keep my hankie with me.